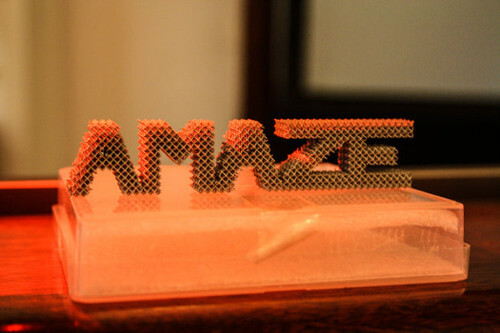 3d-printed titanium structure "Amaze". Image: ESA-N. Vicente. The ESA aims to produce satellite parts and tools directly at the International Space Station. To accomplish this vision, scientists are currently working to perfect the 3d-printing of high-quality metal components. The project is named AMAZE – for Additive Manufacturing Aiming Towards Zero Waste & Efficient Production. At the moment, ESA is setting up four pilot factories where different methods of metal 3d-printing are currently being tested. Furthermore, a complete supply chain for each technology is being and provided. “We want to build the best quality metal products ever made”, said ESA's head of New Materials and Energy Research David Jarvis during a press conference at the London museum of Science. The ESA expects new manufacturing processes and additional application “on earth” from their research. If all goes well, there will soon be metal 3d-printing on the ISS.